Whittier Christian 17, Oxford Academy 4 — Christian Alvis-Labadie went 4 for 5 with three doubles and three RBIs and Austin Hust had three RBIs and scored three runs to lead the Heralds (1-0). Logan Veloff had two RBIs for Whittier Christian. This season will go down as one of the best girls basketball campaigns in area history. The area trio of St. Paul, Sonora and Cantwell each won CIF-SS divisional semifinal games and will advance to next week’s championship round. 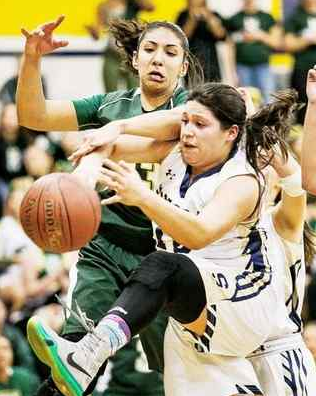 SANTA FE SPRINGS >> The St. Paul High girls basketball team returned to the CIF-SS finals in dramatic fashion Saturday night. Nalon Smith scored 14 points and Valerie Godinez tallied 13 — including 10 in the fourth quarter — to lift the Swordsmen from well behind entering the final quarter and to a 48-46 triumph over Rosary in a 4AA semifinal. St. Paul (19-13) rallied in the second quarter, and took a one-point lead early in the third quarter, but then fell behind 40-33 entering the fourth quarter before the Swordsmen mustered up a huge rally and finally could exhale at the buzzer when the Royals saw a 3-point try carom off the backboard. St. Paul moves on to take on Duarte next weekend at a site to be determined. It is the sixth title-game trip under coach Robert Miller’s tutelage, including a loss to Fairmont Prep last season. Meghann Henderson scored 12 points and Marissa Dunn had 12 as the Raiders continued their sensational season by shocking the No. 2 seed. Sonora (27-3) will face top seed Orange Lutheran, which defeated Lakeside 39-23, in next week’s championship game at a site and time to be announced later. The Cardinals advance to the title game and will face St. Anthony, a 76-39 winner over Notre Dame Academy. The game site and time will be announced later. 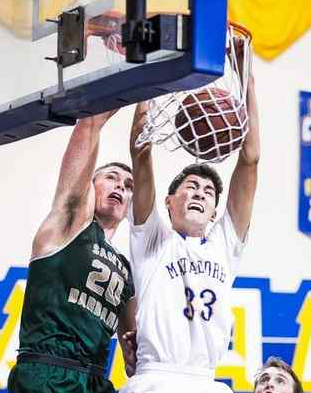 LA MIRADA >> For the third year in a row, the La Mirada High boys basketball team failed to reach the CIF-Southern Section Division 2A final, as the Matadores lost 62-57 to top-ranked Santa Barbara on Friday night in a semifinal game at La Mirada high.The Matadores (24-8) lost to Compton last year and to Santa Margarita in 2014.They did, however, recover last season to win their first-ever state title, and will possibly have that opportunity this year if they get another CIF state invitation. La Mirada won in double-overtime last season against Archbishop Mitty. Santa Barbara (30-1) will play Lynwood, a 64-61 overtime winner over Hart, for the CIF-SS title next weekend at the Honda Center. “It’s very tough for these guys to lose this game at home, especially after doing this the last two years,” La Mirada coach Bryce Jones said. Leading the way for the Matadores were a pair of senior guards, Anthony Newman and Vittorio Reynoso-Avila with 15 points each. Newman’s points came on five 3-pointers. Senior guard Dylan Banks added 10 points for La Mirada. Santa Barbara was led by senior guard Bolden Brace with 16 points, along with 16 points from junior guard Ben Brown. Santa Barbara built a 12-point lead in the opening quarter, 21-9, behind a trio of 3-pointers. Newman hit a 3-pointer with 25 seconds left in the quarter to pull La Mirada to within 21-12. After the Dons built a 26-16 lead on a layup by Brown, the Matadores went on a 10-2 run later in the second quarter, highlighted by a pair of dunks by Daniel Cabrera and Rendwick Helaire (six points). La Mirada scored the last six points of the half, ending with a long 3-pointer by Newman to end the half as La Mirada trailed by just one, 34-33. Both teams traded baskets in the third quarter, with the Dons leading by a basket, 46-44. LA MIRADA >> Defending CIF Southern Section Division 4 girls soccer champion La Mirada took one more big step toward repeating Thursday night with a 2-1 victory over visiting Santa Monica in the quarterfinals.The Matadores will be at Royal (Simi Valley) in the semifinals Tuesday. Junior forward Vanessa Gonzalez got things rolling in the 16th minute with a straightaway goal deep in the penalty area off of a ricocheted attempt and senior Amanda Duran expanded the lead to 2-0 19 minutes later on a breakaway attempt that just squeaked into the net. Viking captain Chloe Kleinman rounded out the scoring after the break with a penalty kick in the 52nd minute, which brought Santa Monica’s fans back into the equation for the rest of the contest. 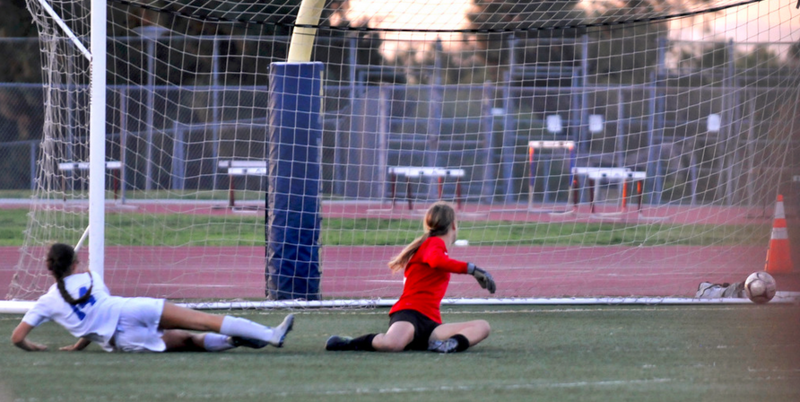 Melissa Torres made sure the score would stay right there, however, notching three of her four saves in the second half. Shots were close in the end, with the Matadores finishing with a 7-6 edge, but La Mirada created the better looks overall. LA HABRA >> Sonora High School’s feisty defense and the outside shooting of Lainie James helped the Raiders to a 49-40 victory over South Hills in the CIF Southern Section Division 3AA quarterfinals on Wednesday.James knocked down four 3-pointers and finished with a game-high 20 points to help the Raiders advance to the semifinals for the first time since 2010. They will be on the road against the Esperanza-Patriot quarterfinal winner on Saturday. Sonora’s Marissa Dunn had 10 points and Angela Rodriguez finished with nine to pace the third-seeded Raiders, who improved to 26-3. The Huskies finished the season 21-8. Sonora raced to a 16-6 first quarter lead and led, 23-12, after Rodriguez’s bucket midway through the second quarter. Denise Wang, who finished with a team-leading 16 points for South Hills, drilled four 3-pointers and hit two 3s toward the end of the first half to cut the Raiders’ lead to 32-25. But the Huskies didn’t shoot well enough, particularly in the second half, falling behind, 45-33, after three quarters. SANTA FE SPRINGS — St. Paul’s playoff win Wednesday night may not go down as an offensive masterpiece, but the Swordsmen used plenty of activity and pressure on the defensive end as one of the keys to their CIF Southern Section Division 4AA quarterfinal triumph over visiting St. Monica. The Swordsmen limited the output of some of the Mariner shooters, and also got to the foul line often in the 57-44 victory that moved them into a Saturday night semifinal against Rosary, which ousted Flintridge Sacred Heart. The game was tied at 13 after the first quarter, and then St. Paul dominated the second period to take a 34-22 halftime lead. The Swordsmen got nine first-half points each from senior guard Adrianna Gonzalez, sophomore guard Valerie Godinez, and junior guard Nalon Smith. The trio wound up combining for 41 points as Gonzalez and Smith each notched 14 points and Godinez totaled 13. The third quarter was battled to a standstill as the Swordsmen took a 43-31 advantage into the final quarter. The Mariners did rally sharply early in the fourth and pulled within 45-40 with about six minutes to play, but the home team then went up 52-40 and there was little suspense left. St. Paul coach Robert Miller: “We were able to kind of control their (top) offensive players. Sonora at Patriot, 7 p.m.
Rosary at St. Paul, 7 p.m.
Cantwell-Sacred Heart of Mary at Twentynine Palms, 7 p.m.